It is never easy to bring a group of people on consensus on any topic. Opinions will always vary within your team, and while that variance is a good thing in many ways, it can be a challenge to sort through the noise in order to make decisive, confident choices that everyone can get behind. 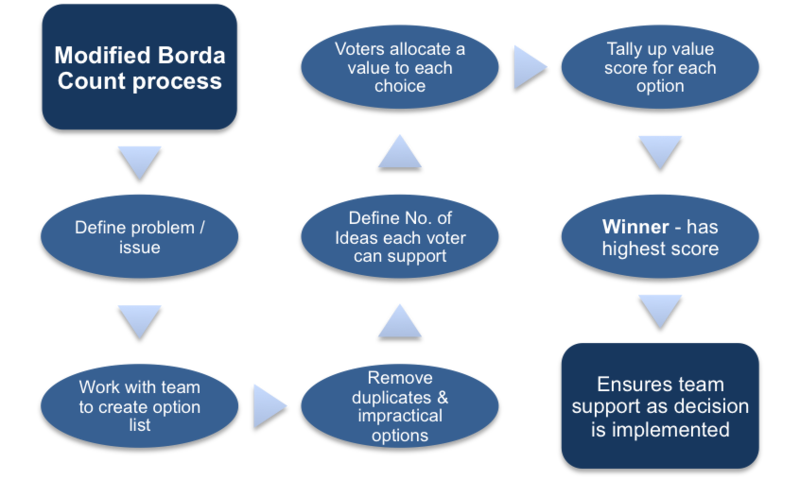 If you are trying to make some important decisions about the future of your organization with the help of your team, you may wish to employ the help of a Modified Borda Count. This is a very simple tool that can be used to allow your team to pick from a variety of options that have been discussed with regard to a specific problem or initiative. 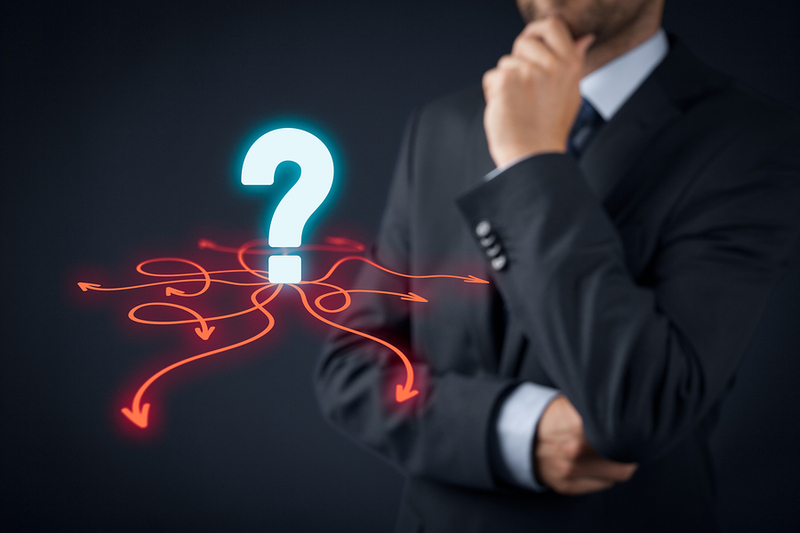 It is one thing to successfully make a decision using the input of a large group – it is another thing entirely to have that group support the decision that has been made. The support of the group is a critical piece of the puzzle, as it is that same group that is going to be tasked with putting the decision into action. By using a Modified Borda Count vote, you can instill confidence in your team by helping them see that the winner was the most popular option among the group as a whole. Even if the winning option was not actually the preferred choice of some of the people in the group, they will hopefully at least be able to appreciate the popularity of the option as the group moves forward. In order to use the Modified Borda Count method, you first need to have a list of options that are going to be the subject of a vote. You can have as many points as you would like on your list of options, but you should keep the list to a reasonable length in order to avoid overwhelming your voters. So where does this list come from? The team members, of course. Ask the team to brainstorm a list of options that can be considered for vote in advance of using the Modified Borda Count system. For example, imagine that you are trying to find ways to cut costs in your manufacturing process. You will likely be able to find a long list of cost-cutting options when you start to ask various members of your team, so have those individuals contribute to a list that you can bring together for the vote. Once the ideas of all of your team members have been brought together, you will need to do a little bit of clean up by combining duplicates and eliminating ideas that simply aren’t practical. The results of your vote are only going to be as helpful as the ideas on the list, so make sure plenty of time and effort is put into developing a useful list of excellent idea. If there are any questions about one or more of the ideas on the list, be sure to work through those questions before going any farther. There should be a general agreement on the part of the team members that the list is worthwhile and logical before going any farther. When the list is finalized, you are going to have a set number of ideas up for vote. For the purposes of this example, let’s imagine that you have a total of 10 ideas which have made the final cut. So, the ballot is going to include ten ideas which can be chosen by those who have been given a vote. However, when the time comes to vote, the team members are going to do more than just place a check box next to their favorite option. Instead of just voting for one item, or voting for a few items as in the case of a Multi-voting system, you are going to have each voter assign points to their chosen ideas. Before starting the vote, you will need to inform each individual how many ideas they can support on their ballot. With a ballot of 10 items, for example, allowing each voter to support 5 of the 10 ideas is a good place to start. So, each person will get to pick 5 of the 10 ideas. When choosing those five, they are going to give each a point value from 1 to 5. Their favorite idea in the entire list is going to get 5 points, the next favorite idea will get 4 points, and on down the list until they assign their 5th choice with a single point. The five ideas that they choose not to vote for will receive no points. Finishing off the use of a Modified Borda Count is simple – just tally up the points from the vote, and you will have a winner. Using a spreadsheet is the best course of action for this task, as you will easily be able to reorder the spreadsheet to put the highest point totals at the top after all of the ballots have been included. The options with the highest number of points will be the winners of the vote. You can use this system to identify a single winner, or you can use it to pick out a few winners from a large field. To go back to our example regarding cost cutting measures for a manufacturing process, you could use a Modified Borda Count to pick out three cost cutting measures to explore. By using this method, you will know what the top three options are in the eyes of your team, and you will be able to move forward this those ideas. It shouldn’t take long to go through the process of taking a Modified Borda Count, but you can learn plenty from the scores that it produces. As long as you take the time to create a quality list, and you give everyone the privacy they need to vote honestly, the outcome of this process should be something that can give you confidence in the choices you make going forward. You can read more about the Modified Borda Count in our free eBook ‘Effective Group Decision Making’. Download it now for your PC, Mac, laptop, tablet, Kindle, eBook reader or Smartphone. The Modified Borda Count is a simple tool that can be used to allow your team to pick from a variety of options the one which is the most popular option among the group as a whole. It can be used where the support of the group is critical, as it is that same group that is going to be tasked with putting the decision into action. Ideally, the group itself will have a significant input into deciding on the list of options to be considered. Instead of just voting for one item, or more items as in the case of a Multi-voting system, each voter assign points to their chosen ideas. This is done on a points system (say 1 to 5 points) with 5 points being given to the favoured option, four to the next, then 3 and so on.